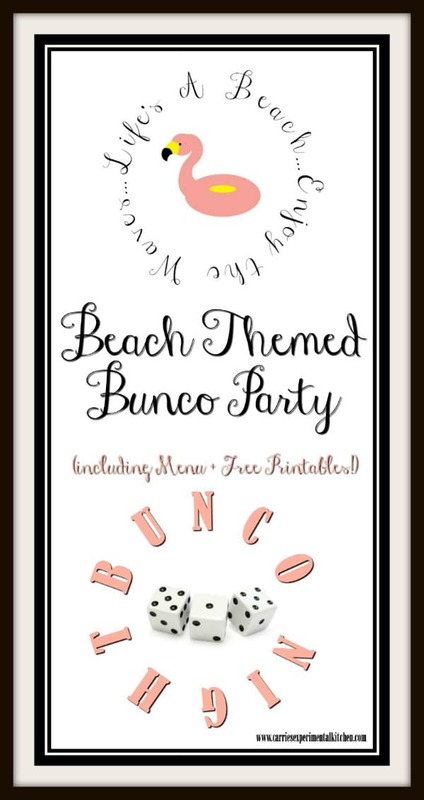 Have even more fun while hosting your next Bunco night with these Beach Themed Bunco Party menu ideas; including free game printables! Yes. 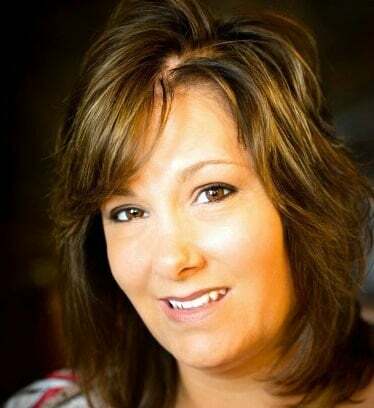 I play Bunco and have been for several years now. It’s a fun night where twelve women get together once a month to let loose, chat about nothing (and everything), eat and drink a little (or a lot…what happens at Bunco, stays at Bunco!) and of course, play the dice game. I explained the game a few years ago briefly in this post, but basically you and your partner roll three dice to try to beat everyone else to either 21 points or Bunco; which is when you roll three of the same number and you’re rolling that particular number. You then have to keep moving and switch partners with every number you roll (1’s, 2’s…6’s; then repeat four times) until the game is over. You then tally the scores, win some money and call it a fun night out. One of the best parts about playing Bunco is that since there are only twelve players and we play once a month, you only have to host once a year. Most of the time, and of course depending on what month I draw, I just come up with a theme the week before and make some food and get some decorations to tie into my theme. But this year, I decided to go all out with a beach theme since I just came back from a Florida vacation and miss the sun and sand already. Besides, I haven’t done a theme party post on here in quite some time. 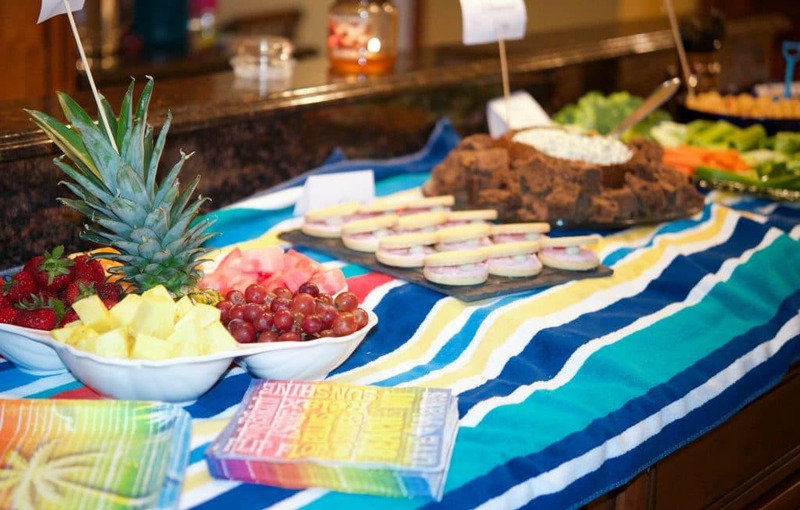 The following Beach Themed Bunco Party ideas are not only for Bunco, you can use the food ideas for any fun event you want to host throughout the year. I do have to say that most of these ideas I found on Pinterest; however, what I did find were just names of things and no recipes were attached so the recipes below are from yours truly. It will give you a good starting point as well and feel free to make them your own. 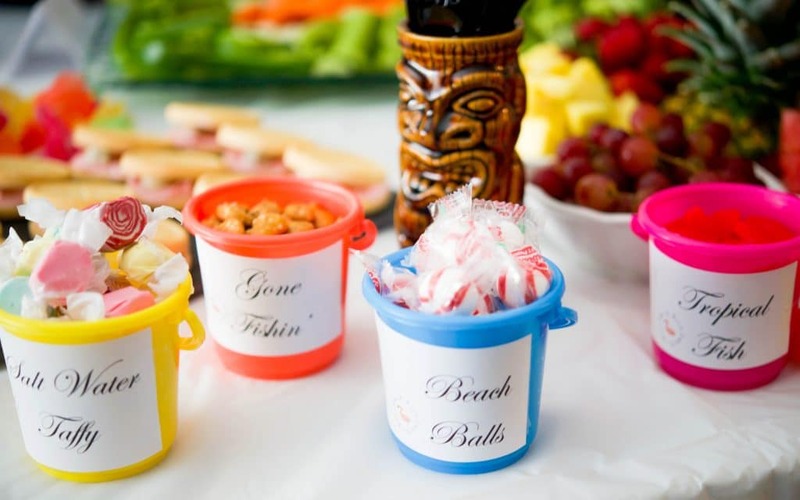 First up, are the Beach Themed Bunco Food (download printable labels). You can’t have a party without food (or at least I can’t!). We generally gather for at least 30 minutes prior to starting the game to eat a drink a little, before heading to the tables; then take a “halftime” break in the middle of the game to come back to eat and drink some more. I found this idea on the Oriental Trading website and thought it was the cutest thing…and so clever! The beauty of these sandwiches is that you can fill them with anything you want. I opted to take the easy route and make two types: Roast Beef & Havarti with a Horseradish Mayo and Turkey & Cheddar with Dijon Mayo. 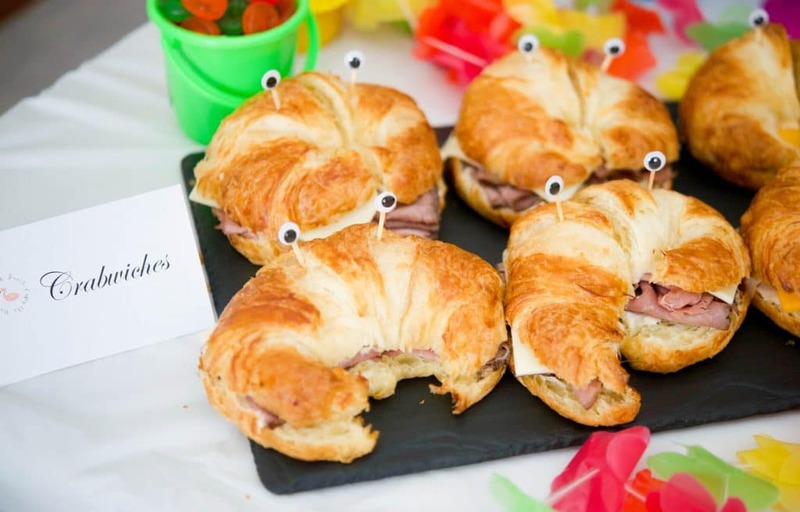 It’s funny, I never thought of a crab while looking at a croissant, but they really do! 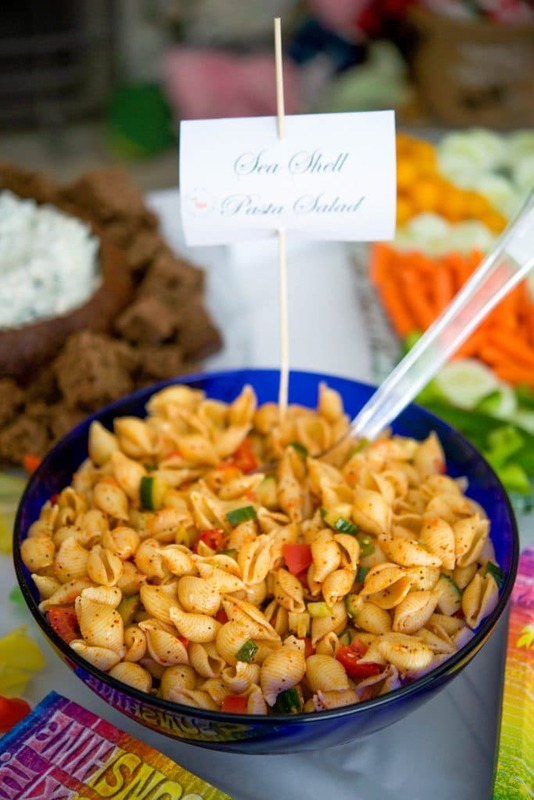 Make your favorite pasta salad however you’d like, but use shell shaped pasta. I opted for a simple salad made with cucumbers, tomatoes, and scallions; then used Salad Supreme seasoning mixed with white vinegar and canola oil. 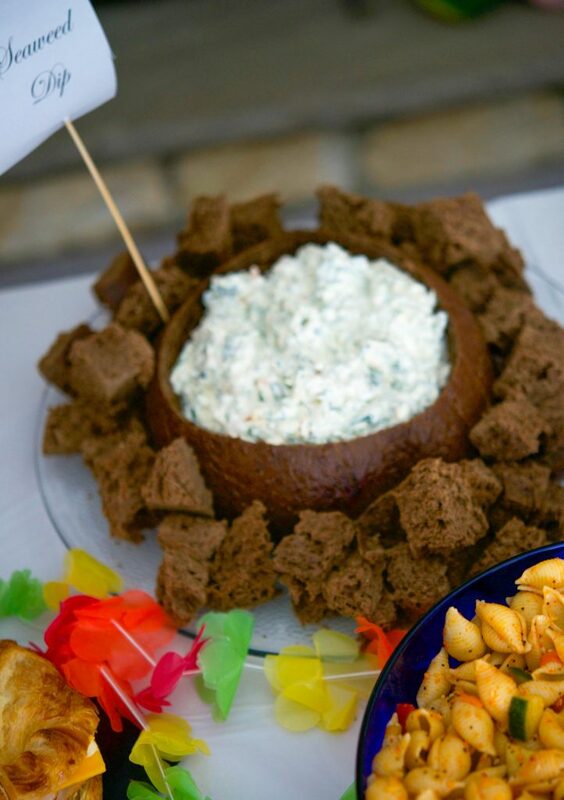 I loved the name of this dip when I found it on Pinterest and thought it would be perfect for my beach themed party. Knorr Spinach Dip is a definite favorite and this one was a definite hit with my guests! 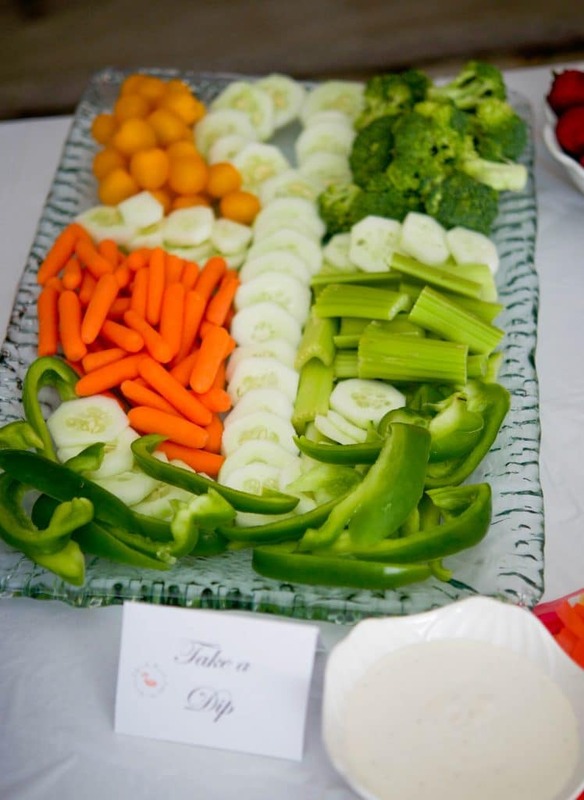 When I saw a crudité platter shaped like an anchor I wanted to try it myself. It came out “ok”, but next time I think I’ll try this fish instead. You can use whatever cut up vegetables and dip you like. I used Ranch dressing for this one, but my favorite dip that I usually make is this one; however, I was trying to save some time where I could. 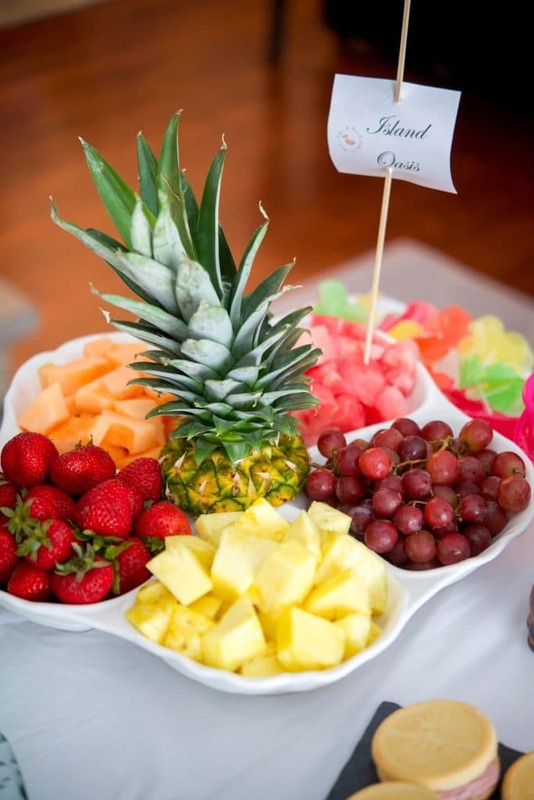 This Fruit Platter is pretty self explanatory, but cut up your favorite fruit; including a pineapple so that you can use the top of it to place in the center. 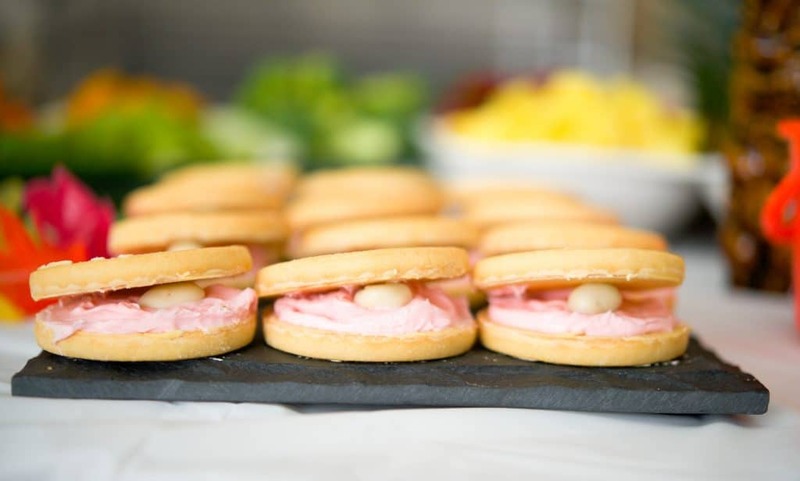 Cookies shaped like oysters…I LOVED this dessert idea from Cupcake Diaries! The only switch I made was that I used a different type of lemon cookie which actually had a lemony icing on the flat side and instead of yogurt covered raisins, I used Greek Yogurt Covered Cranberries. They were delicious and so fun! This Sea Water or Blue Rum Punch was a delicious, though a little sweet for my taste. 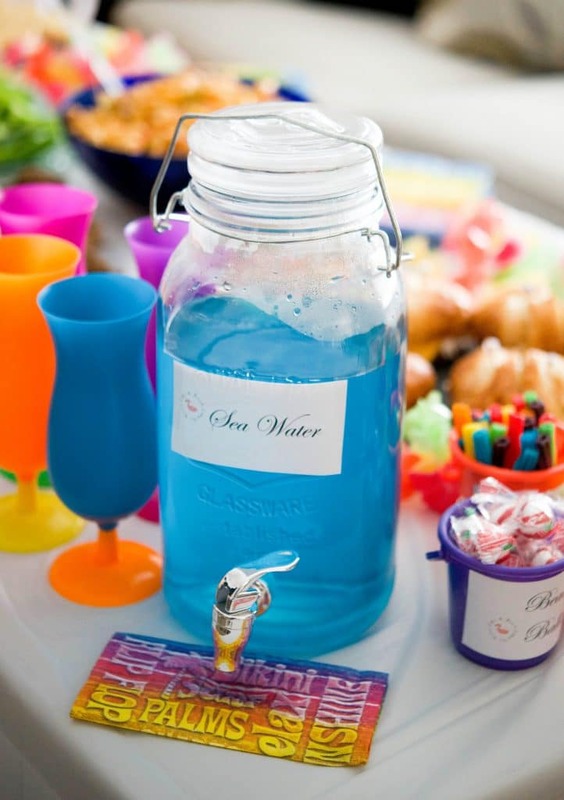 I found this idea on Pinterest which used vodka, blue Hawaiian Punch, blue Gatorade and Sprite. I adjusted the recipe a bit by using coconut rum instead of vodka and Berry Burst Hawaiian Punch. To make the punch, I used equal parts of Gatorade and punch; half the amount of alcohol and top off with some Sprite. I used a one gallon beverage dispenser with a spout and for a fun twist, serve the drink in festive Hurricane Tumblers. 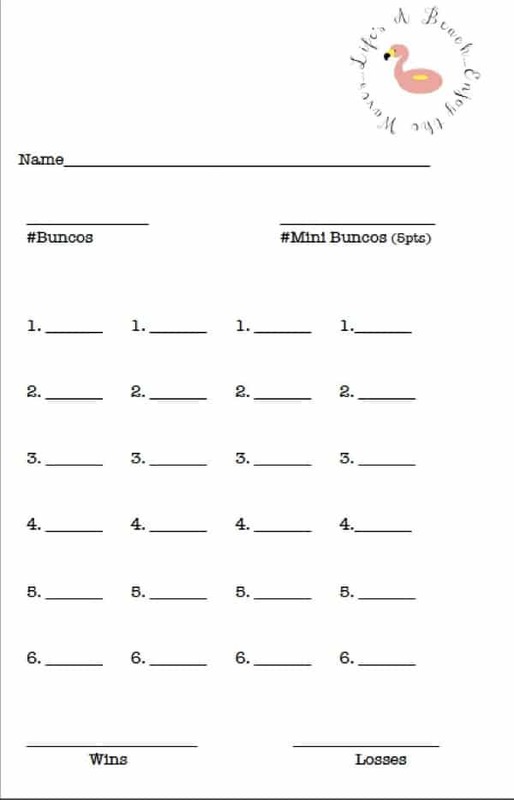 When playing Bunco, there are three tables: Winner, Middle and Loser (download printables). Of course, with all of that moving around and “stressful” dice throwing, we need to have something to munch on! And believe it or not, those cute little tiki looking glasses that I put forks in I’ve had for years. My in-laws almost sold them in a garage sale, but my kids loved them so much, they took them for themselves and have used them every summer for their virgin piña coladas! Luckily, you can still find something like them on Amazon! 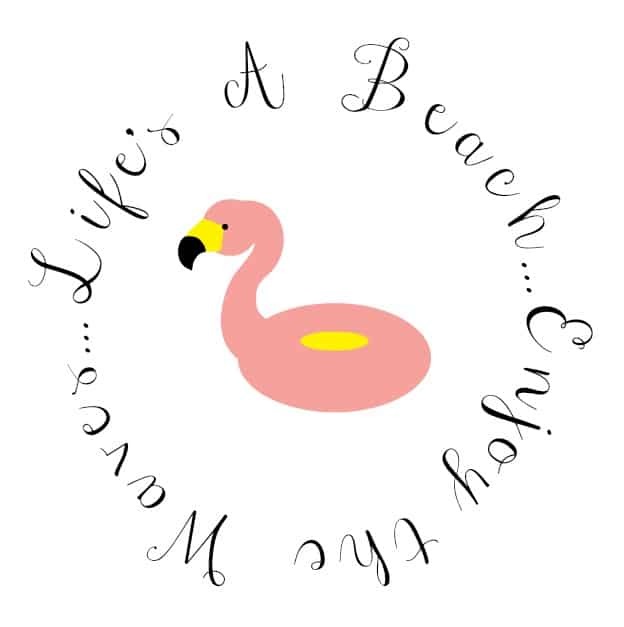 Now of course, you have to keep score with the Beach Themed Bunco Score Sheets (download printable). It’s not that hard, just mark down a W or a L if you and your partner either won or lost that particular round. For our game, we pay $15 each to play giving us a total of $180 to disperse to the winners. All in all, even if you don’t win anything, where can you go out for several hours, have lots of laughs, great food and drink for only $15. Oh and did I mention there are no kids/families permitted to be home during the game? It’s a win-win all around! ~Enjoy and Good Luck! Don’t forget to visit the recipe index to search for more recipes by category. What was the best theme party you’ve ever attended?